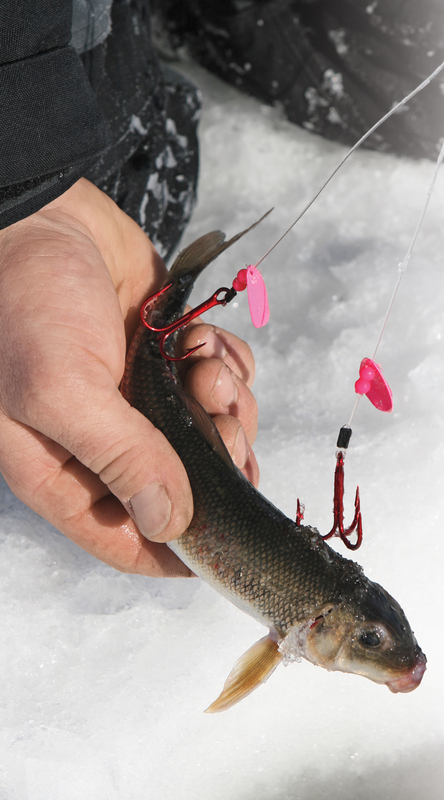 There’s something special about ice fishing for giant pike—spotting a tip-up flag as it springs from the release, seeing the spool spinning wildly. You snub the line, feel the fish, and set the hook. Then there’s the moment when you see the fish’s great green snout as it’s pulled up through the hole and then its tooth-filled head the size of a crocodile comes into sight. You slip your hand behind its gill plate, slide the fish onto the ice, and time stands still. The most important consideration for catching giant winter pike is fishing at the best locations. The most productive spots change depending on the type of lake and when during the Coldwater Period that you’re fishing. What doesn’t change, however, are the best ways to find them, which often starts before you put the boat to bed in the fall. Autumn is not only a marvelous time to target trophy pike, it’s the perfect occasion to pinpoint prime winter locations, especially on Shield-type waters at first ice. In the fall, pike feed heavily to gain nourishment to aid in the egg maturation process (remember pike spawn so early in the spring that ice often still covers the lake) and carry them through the upcoming frozen-water period. Fall is also a period of consolidation, when big pike move away from deep weededges where they spent the summer and gather around what I call bus stops. I find these stops by noting the location of the best summer weedlines and then the nearest primary main-lake points that break into deep water. Even better if there’s a large ledge or feeding flat in the 10- to 20-foot depth range associated with the point. You find these bus stops swarming with pike that are following yellow perch, white suckers, and walleyes that are transitioning to their deep-water fall and winter locations. Even better still, big pike are lying in wait to intercept the hordes of ciscoes, whitefish, and lake trout that are moving shallow to spawn. Mark bus stops carefully on your GPS chartplotter that you use in winter. I keep a hand-held unit in the boat for this purpose, using it to revisit marked spots when ice arrives. According to Matity, as soon as the pike/cisco connection is over, pike do one of two things at first ice: either follow their prey out into open water and hunt for them in a suspended environment, or return to prime structures and cover where they can use weedlines and breaklines. Jeff Matity has some advice on whether you should hang deadbaits horizontally or vertically. Both methods can be productive, but he says you need to consider the location and winter sub-season. At first ice, when ciscoes are spawning and again in midwinter when they’re stealing burbot eggs, pike are used to hunting and seeing their prey in a horizontal swimming-like position, he says. At last ice, on the other hand, a nose-down attitude resembles a winterkilled fish and thus, a deadbait presented vertically outfishes one presented horizontally on most days. 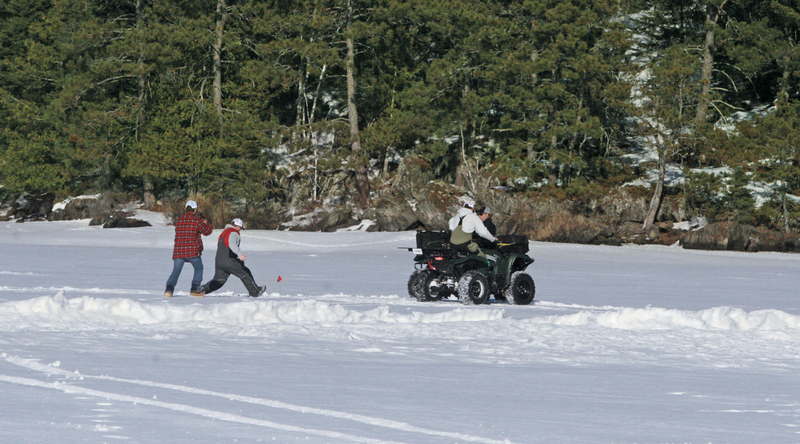 Where you can fish multiple holes, it pays to experiment. 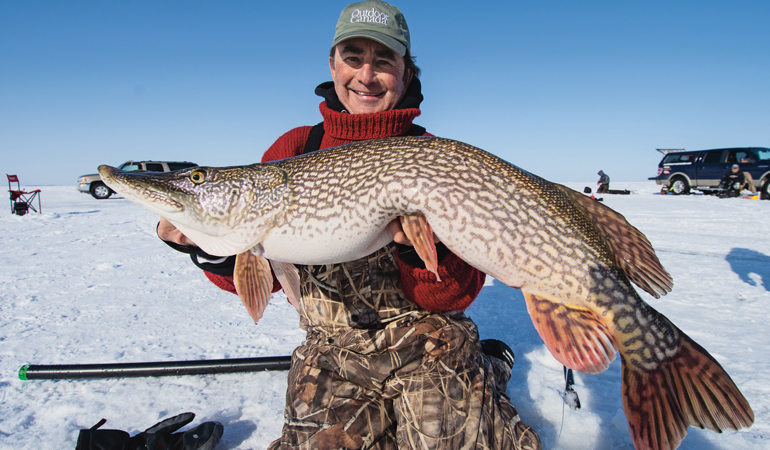 Few anglers get to spend as much time in pike paradise as Bryan Bogdan, owner of Wekusko Falls Lodge in northern Manitoba, one of the few resorts that remains open in the winter catering to ice anglers. After he explores river mouths on his run-and-gun reconnaissance missions, he checks the area fronting large beds of deep weeds. He says some pike are always on a yellow perch/walleye diet. Finally, he terminates his search setting up on submerged rockpiles. Bryan Bogdan has spent more time than most studying how big pike lock in on a deadbait hanging down from a tip-up. And he has watched them frantically scoot away when someone inadvertently made noise while walking on the ice. He says if you think a big pike only remembers the last 15 seconds, rethink your strategy. Knowing this to be true, we’ve turned many a slow day around by riding a snowmobile or ATV through our setup. It gets the fish moving and then, they often spot the hanging deadbaits. While vegetation can produce consistent pike action throughout winter, Mitchell and Bogdan also suggest staying mobile, checking hard-bottom main-lake structures like underwater points and rockpiles, especially during the midwinter doldrums. “Big main-lake structures with boulders and walleyes typically produce big pike for us every winter,” Mitchell says. “I’ve caught big fish by hanging deadbaits halfway down over structure topping out in 15 to 25 feet of water. Maybe suspended baits leave a better scent trail for pike to follow. In midwinter, regardless of location, Bryan Bogdan says you’re missing out on the biggest pike in the lake if you don’t fish at night. The key combination is a clear evening and a full moon. According to Bogdan, it’s when the giants gorge. Like Mitchell, Bogdan spends plenty of time camped out over hard-bottomed main-lake structures during midwinter, noting that primary and secondary shelves in the 12- and 20-foot range provide ideal feeding platforms. He zeros in on narrow bays. “I love fishing mouths of shallow, finger-like bays, where you can intercept fish moving in or out,” he says. In February and March, Matity sets his sights on shallow, sand- and gravel bars where burbot (a.k.a. ling and eelpout) are spawning. “Big pike never miss a meal in winter,” he says. “Mother Nature intervenes with one more feeding opportunity to help pike complete their egg development and enter the spawning season in top condition. The event is the month-long burbot spawning season when they invade shallow main-lake shoals. “When you put down an underwater camera on one of these spawning shoals, it looks like a moonscape,” he says. “You won’t see a single shiner, crayfish, or perch. But the burbot aren’t alone. Look up and you see ciscoes hiding right under the ice. They scoot down and steal burbot eggs whenever one of the sentries lets his guard down. He never hesitates setting tip-ups right in vegetation, spooling his reels with line stout enough to pull up and haul in weeds along with his fish. He also says that pike cruising these shallow grassy flats take less time deciding to eat your bait and strike more forcefully. 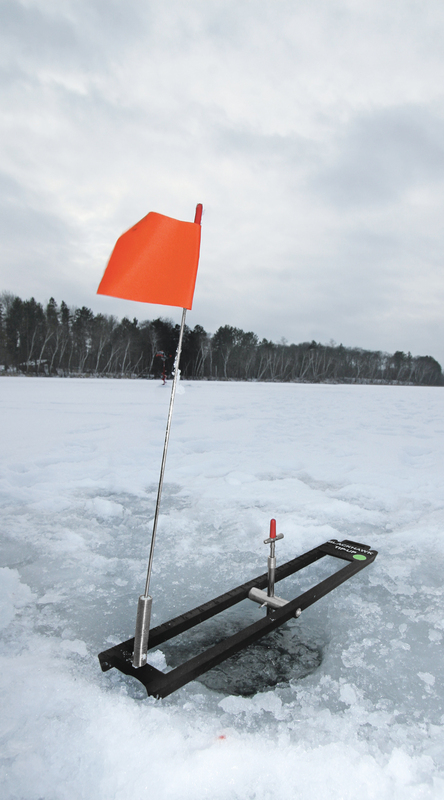 *In-Fisherman Field Editor Gord Pyzer, Kenora, Ontario, has been contributing to In-Fisherman publications on ice-fishing topics for more than two decades. Sb 2315 - final house vote delayed! !